The premiere nature education campus – and interactive model of sustainability – was designed by Siegel & Strain Architects for NatureBridge and the National Park Service. 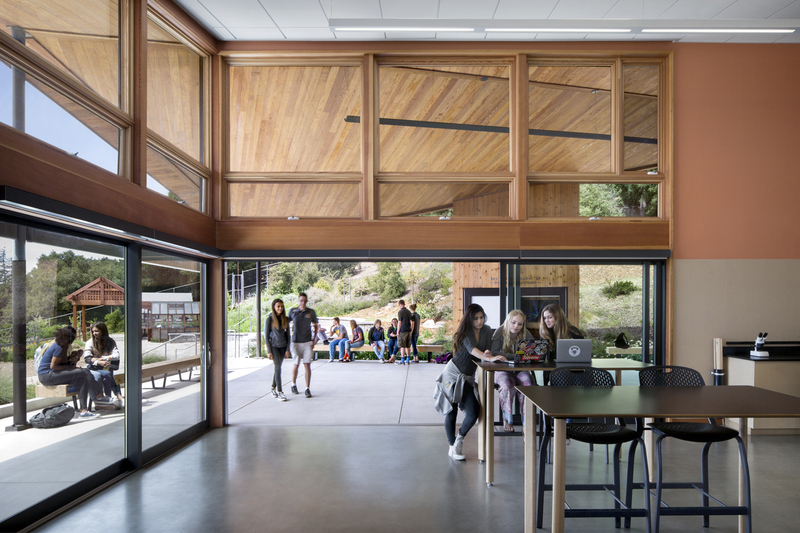 EMERYVILLE, Calif., Nov. 1, 2018 /PRNewswire/ -- On October 11, NatureBridge and the National Park Service held a ribbon-cutting ceremony to dedicate the National Environmental Science Center. The new Henness Ridge campus team is celebrating the completion of five of 17 buildings designed by Siegel & Strain Architects. This is the culmination of a decade-long partnership in planning and design. Completed so far are a dining hall, bath house, two cabins, and a maintenance building. 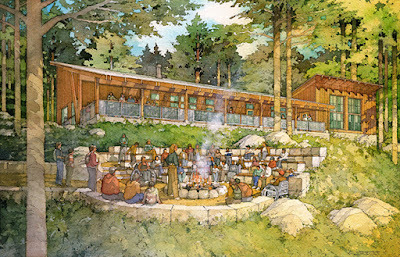 Additional buildings will include the main dining hall, classrooms, a fire station, more cabins, staff housing, and support facilities. Planning for the next phase will commence soon. Each year, more than 15,000 students and teachers come to experience and learn from Yosemite National Park through outdoor science programs offered by NatureBridge. This new residential campus uses the latest sustainable design and energy conservation concepts with the site's inherent attributes to provide an interactive model of sustainability in which program participants can engage firsthand. The center is projected to be net zero energy; provide 60 percent water savings compared to conventional use; and minimize construction waste. 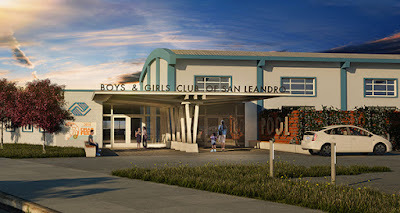 The project is designed to attain a LEED Platinum rating. Architect Nancy Malone, AIA, who led the project for Siegel & Strain with Henry Siegel, FAIA, explained that the project was designed to reflect the natural conditions. "We hope it will inspire students by connecting them to this special setting, to the cultural tradition of rustic park design, and to the educational mission of environmental stewardship," Malone said. 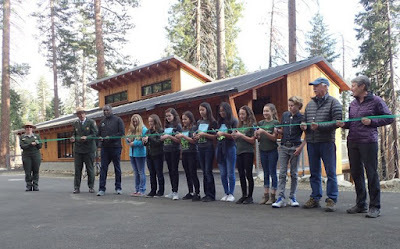 Kristina Rylands, NatureBridge director of the Yosemite Campus, described how students will interact with this place: "This will be a permanent home for youth education in Yosemite -- one of the most iconic parks in the world," she said. "The grandeur of Yosemite allows students to become part of something larger than themselves. 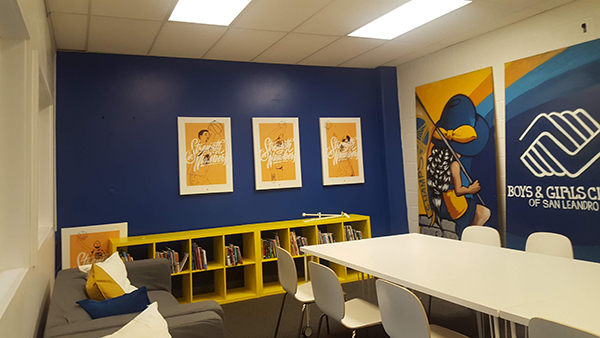 This new center will be a portal to self-discovery and a home for youth education for the next 100 years." Phil Kilbridge, President/CEO of NatureBridge, said that this is a long-term investment in people and park. "The Center will enable transformative educational experiences in the outdoors for more than one million kids in its first 50 years," he said. "It is more than a campus, it is a declaration – that our parks belong to all of us, and that these experiences are essential to the health of our children and planet." The design team developed formal and informal learning spaces to foster environmental literacy using visible and interactive sustainable design strategies. Students will learn from different types of photovoltaic panels, local and renewable materials, and interactive monitoring systems for greywater harvesting and renewable energy. The center integrates the latest design and energy efficiency concepts to provide a model of sustainability that, with 100% universal access, will allow all participants to interface with the next level of experiential education. At the ceremony, Yosemite National Park Superintendent Mike Reynolds put the project into context: "Many people are familiar with legacy projects in our parks," he said. "The National Environmental Science Center is a legacy project for the next 100 years." Founded in 1971, NatureBridge connects young people to the wonder and science of the natural world, igniting self-discovery and inspiring stewardship of our planet. As the largest residential education partner of the National Park Service, the organization serves more than 35,000 students each year and offers programs in six national parks: Yosemite National Park, Golden Gate National Recreation Area, Olympic National Park, Santa Monica Mountains National Recreation Area, Channel Islands National Park and Prince William Forest Park. To view the original press release, click this link. As a rule, architects LOVE coffee. Here at Siegel and Strain we are not the exception. On Friday, October 5, we walked the two blocks to Counter Culture's Bay Area Training Center. We did an hour of "cupping" tasting where we first smelled and then drank two Ethiopian coffee roasts, comparing the subtle flavors that differentiate the two. Not only did we get to spend an hour in their beautiful tasting room, we also got to learn more about one of our favorite water cooler topics, before heading back to work. Climate change is happening. No help and a lot of hurt is coming from Washington. Architects are going to have step up our efforts. Buildings account for close to half of the Green House Gas (GHG) emissions in the U.S.
We can design and advocate that all new buildings be zero net carbon (ZNC) – super-efficient, all electric and powered by renewable energy. (Adding short term on-site battery storage also helps the grid stay off fossil fuels when the sun isn't shining.) 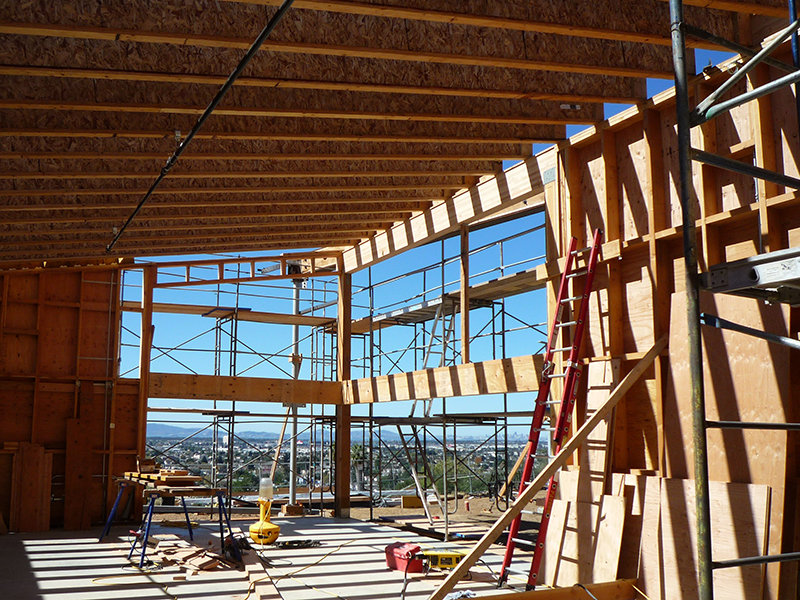 If our buildings can't achieve ZNC, they can be ZNC ready, and can still be powered by 100% off-site renewable power, through programs like Community Choice Energy or PG&E's Solar Choice program. We can reduce the embodied carbon footprint of our buildings. Building a new home generates 30-50 tons of GHG emissions and larger commercial buildings generate a lot more – equal to more than 10 years of operating an efficient, code compliant building. When our new buildings are ZNE, embodied carbon accounts for all the emissions. We can reduce those emissions by 25-30% by just focusing on concrete and a few other materials. Higher reductions are possible when we pay attention to everything else, and use carbon sequestering materials. Building with materials that are made from atmospheric carbon – wood, straw, and, coming soon – concrete and even plastics – could transform our buildings into carbon sinks instead of carbon emitters. We can design and advocate for reusing and upgrading existing buildings instead of building new ones, which saves carbon twice – reuse generates less carbon emissions than building a new building and upgrading reduces the operating emissions from existing buildings. (Operating existing buildings accounts for 95% of all building emissions). Most existing homes and a lot of commercial buildings could be retrofitted to be ZNC. None of this is easy, but if we're serious about addressing climate change, it's what needs to be done.